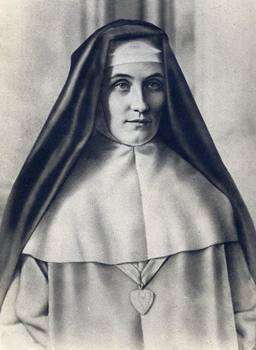 Sister Mary of the Divine Heart (Münster, September 8, 1863 – Porto, June 8, 1899), born Maria Droste zu Vischering, was a person of old German nobility (Uradel) and Roman Catholic nun of the Congregation of Our Lady of Charity of the Good Shepherd, best known for having influenced Pope Leo XIII to make the consecration of the world to the Sacred Heart of Jesus. Pope Leo XIII himself called this solemn consecration "the greatest act of my pontificate". The Erbdrostenhof Palace (Münster, Germany) was her birthplace. Maria Anna Johanna Franziska Theresia Antonia Huberta Droste zu Vischering was born with her twin brother Max on September 8, 1863, solemnity feast of the Nativity of Our Lady, in the Erbdrostenhof Palace, in Münster, a city in the North Westphalia region, Germany, the daughter of one of the noblest German families who distinguished themselves by their fidelity to the Catholic Church during the persecution of the Kulturkampf – her parents were Klemens Heidenreich Franz Hubertus Eusebius Maria, the count Droste zu Vischering, and Helene Clementine Maria Anna Sybille Huberta Antonia, the countess of Galen. Because of the fragility of her health, Maria was baptized immediately at birth. 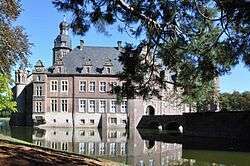 The Castle of Darfeld where she spent her childhood. Maria was taught at home by governesses. On April 25, 1875, Maria and her brother Max, received First Communion. In April 1879 Maria continued her education at the boarding school of the Sacré-Coeur Sisters in Riedenburg in Bavaria. While there she heard a homily on Psalm 45 where it says, “Listen, my daughter, ... forget your father’s house..., the king will fall in love with your beauty…” Maria decided that she should become a religious. During the spring of 1879, during one of the sisters particular devotion to the Heart of Christ, Maria Droste zu Vischering reached an important conclusion: "I began to understand that without the spirit of sacrifice the love of the Heart of Jesus is merely an illusion". 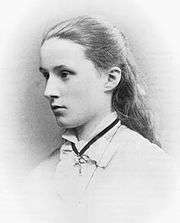 Maria Droste zu Vischering at 15 years old (1878). While at school, she contracted pneumonia and shortly before her eighteenth birthday, returned home to recover. In 1883, at the chapel of the Castle of Darfeld, Maria is said to have had an interior locution of Jesus Christ who said her: "Thou shalt be the wife of My Heart". On 5 August of that same year, on the Silver Jubilee of her parents' marriage, Maria told them of her desire to become a religious. On 21 November 1888 Maria entered the convent of the Good Shepherd in Münster and on 10 January 1889 she received the habit. She was given the name "Maria of the Divine Heart". Sister Mary of the Divine Heart Droste zu Vischering as Mother Superior of the Convent of the Sisters of the Good Shepherd in Porto, Portugal (1896). For Maria Droste zu Vischering, the devotion to the Heart of Christ always merged entire with the devotion to the Blessed Sacrament. "I could never separate the devotion to the Heart of Jesus from the devotion to the Blessed Sacrament, and I will never be able to explain how and how much the Sacred Heart of Jesus deigned to favor me in the Blessed Sacrament of the Eucharist". In 1888, she visited with her mother the Hospital of Darfeld and there she found a girl who had given scandal. Maria Droste zu Vischering reached out to the unfortunate. This episode can be considered her first contact with the charism of the Sisters of the Good Shepherd. In the Parish Church, a short time later, she heard again the voice of Jesus who told her: "You must enter in the Convent of the Good Shepherd". Maria then decided to enter to the novitiate of the Convent of the Good Shepherd of Münster. At the age of twenty-five, Maria Droste zu Vischering joined the Congregation of Our Lady of Charity of the Good Shepherd. After she received the white religious habit of the religious congregation,Maria also received the name that became for her a program of life: Sister Mary of the Divine Heart. In 1891, she devoted herself to the girls sent to the Good Shepherd Sisters in Münster for rehabilitation and care. With an ardent love for youth ministry, she maintained: "the most needy, the most miserable, the most forsaken are the children I love best". Sister Mary of the Divine Heart spent only five years in Münster, because she was called by obedience to a special mission. In 1894, at the age of 31, she was transferred to Portugal, where she was initially sent as assistant of the Mother Superior of the Convent of the Good Shepherd Sisters in Lisbon. From February to May 1894 she remained in the Portuguese capital, but was appointed to the position of Mother Superior of the Convent of the Good Shepherd Sisters in Porto. 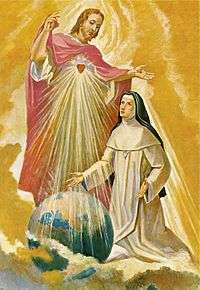 While she was in Porto, Portugal, Sister Mary of the Divine Heart reported several messages from Jesus Christ in which she was asked to contact the pope, requesting the consecration of the world to the Sacred Heart of Jesus. Painting representing the vision received by Blessed Mary of the Divine Heart Droste zu Vischering. Jesus had revealed her: "By the brightness of this light, peoples and nations will be illumined, and they will be warmed by its ardour." On June 10, 1898, her confessor at the Good Shepherd monastery wrote to Pope Leo XIII stating that Sister Mary of the Divine Heart had received a message from Christ, requesting the pope to consecrate the entire world to the Sacred Heart. The pope initially did not believe her and took no action. However, on January 6, 1899 she wrote another letter, asking that in addition to the consecration, the first Fridays of the month be observed in honor of the Sacred Heart. In the letter she also referred to the recent illness of the pope and stated that Christ had assured her that Pope Leo XIII would live until he had performed the consecration to the Sacred Heart. Theologian Laurent Volken states that this had an emotional impact on Leo XIII, despite the theological issues concerning the consecration of non-Christians. Pope Leo XIII commissioned an inquiry on the basis of her revelation and Church tradition. In his 1899 encyclical letter Annum sacrum, Leo XIII decreed that the consecration of the entire human race to the Sacred Heart of Jesus should take place on June 11, 1899. In the encyclical Leo referred to the illness about which Sister Mary had written, stating: "There is one further reason that urges us to realize our design; We do not want it to pass by unnoticed. It is personal in nature but just as important: God the author of all Good has saved us by healing us recently from a dangerous disease." Death of Sister Mary of the Divine Heart, countess Droste zu Vischering, in the Convent of the Sisters of the Good Shepherd in Porto, Portugal (1896). Sister Mary of the Divine Heart died on June 8, 1899, the feast of the Sacred Heart, three days before the consecration, which had been deferred to the following Sunday. Blessed Mary of the Divine Heart's incorrupt body is exposed for public veneration in the Church of the Sacred Heart of Jesus, in Ermesinde, in northern Portugal. The church is adjacent to the Convent of the Good Shepherd Sisters. There is also a relic of her body exposed for public veneration at the Sanctuary of Christ the King in Almada, near Lisbon, Portugal. Tomb of Blessed Mary of the Divine Heart inside the Church of the Sacred Heart of Jesus (Ermesinde). In 1964, Sister Mary of the Divine Heart, the countess of Droste zu Vischering, officially received the title of Venerable by the Catholic Church. On November 1, 1975, she was declared blessed by Pope Paul VI. Doctor Waldery Hilgeman is the Postulator of the cause of canonization. ↑ Letter from Sister Mary of the Divine Heart dated June 23, 1897, in Autobiography of Blessed Mary of the Divine Heart, Religious of the Good Shepherd. Lisbon: Edition of the Congregation of Our Lady of Charity of the Good Shepherd, 1993. ↑ Letter from Sister Mary of the Divine Heart dated August 13, 1897, in Autobiography of Blessed Mary of the Divine Heart, Religious of the Good Shepherd. Lisbon: Edition of the Congregation of Our Lady of Charity of the Good Shepherd, 1993. Louis Chasle; Sister Mary of the Divine Heart, Burns & Oates, London (1906). Max Bierbaum; Maria vom Göttlichen Herzen Droste zu Vischering: Ein Lebensbild. Unter Benutzung unveröffentlichter Quellen, (1966). Antonio Ricciardi; Più nobile per Carità: Beata Maria Droste zu Vischering (1863-1899), 261 pp., Edizioni Agiografiche, Italia (1975). Joaquim Abranches; Beata Maria do Divino Coração, Mensageiro do Coração de Jesus, Braga, Portugal (1970). Wikimedia Commons has media related to Maria Droste zu Vischering.